With the support from different sectors, the Hong Kong Orienteering Club was founded by a group of orienteering enthusiasts in August 1979 and was the first orienteering club in Hong Kong promotes orienteering and opens to all. To promote orienteering in Hong Kong, so that participants strengthen their self-confidence, abilities to handle emergency and to make judgment；develop interest in the outdoor pursuits; to nurture and sponsor members to participate in open orienteering events. To exchange outdoor techniques, experiences and knowledge with other outdoor activities’ organisations. We organise courses, technical trainings, practice events, open competitions and family activities for different ages. Orienteering activities format include country side, city, day event, night event, relay and team O etc. In addition, various outdoor pursuits and recreational activities are provided for members. Anyone who is interested in orienteering may apply for the following types of member. Junior Member Age 6-17 $20 $40 With written consent by parents or guardians. with unlimited number of dependent family members other members of the family are Dependent Family Member. Dependent Family with unlimited number of dependent family members other members of the family are Dependent Family Member. Honorary President with spouse and children, Honorary President, other members of the family are with Dependent with unlimited number of dependent family members Dependent Family Member. The membership year runs from 1 July to 30 June next year. However, if you are accepted to be a member from 1 January to 30 June, then your membership will expire on 30 June the year after. Member can renew their membership in from 1/5 to 30/6 of each year. If membership is expired after the renewal period, membership shall be applied as a new member. Fill in a membership application form. 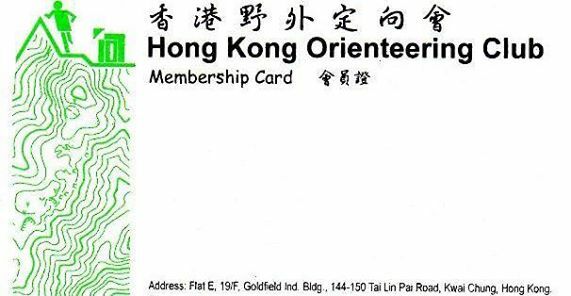 Pay the appropriate fee by crossed cheque which is payable to “Hong Kong Orienteering Club” and send to:" Hong Kong Orienteering Club", Flat E, 19/F, Phase 1, Goldfield Industrial Building, 144-150 Tai Lin Pai Road, Kwai Chung, NT. , or email pdf file of a e-cheque to membership@hkoc.org, or pay membership fee via PayPal. Note: According to Clause 13(40) of the M&A of the Cub, member who's membership is expired needs to renew his/her membership within the renewal period. After the membership renewal period, expired membership will be terminated. The member needs to subscribe membership again as a new member. If member registered as OAHK member via HKOC, please register & pay in OAHK Membership On-line Application form. OAHK will send to HKOC a list of membership applicants every two weeks for Affiliated Club certification. The Membership Officer of HKOC will then certify the membership list and send back to OAHK within two weeks. OAHK will notify the applicant individually by email about the application status. During the period in between submission of an OAHK membership application and OAHK notify the applicant of the application status, OAHK will treat the applicant as an OAHK member. If an application is unsuccessful, the OAHK membership status starting from the application will be revoked. From 2016, under the new arrangement of OAHK On-line Membership Application & Payment System, we will offer special concessionary activity rate to Junior Member who ranks in OAHK under HKOC, instead of sponsor membership fee for our Junior Members. So please register and pay for your OAHK Membership directly.